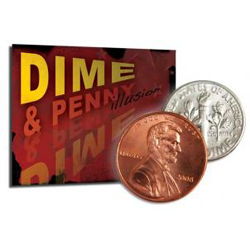 A Dime and a Penny are shown to your spectator. Magically, the Dime vanishes right before your spectator's eyes! This one is a real visual trick that is sure to amaze. Step-by-step illustrated directions. Easy to learn!